If you have been following my series on “Mastering Content Curation” then you realize there are many different types of content and ways to find content to share with a business’ target audience. Today, in the fourth post in the series, we are going to explore content curation platforms and how using these types of sites can help a business find content to share. 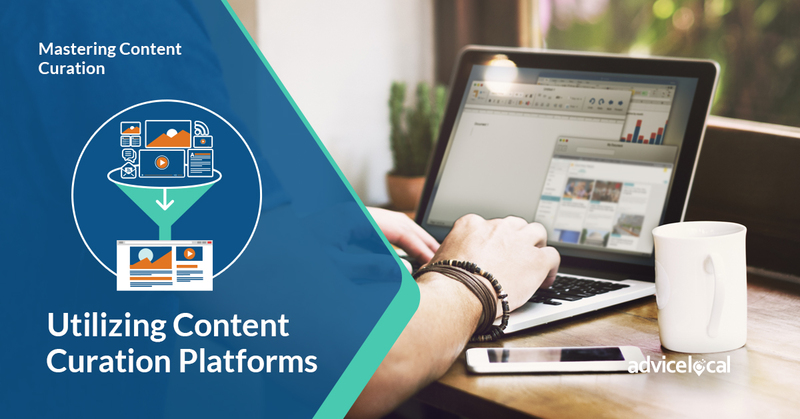 These platforms can also be used as a tool to deliver the content to a business’ audience. Content curation platforms search the web (or their site in some cases) for appropriate content in response to a keyword query and return results, much like a Google search. Most of these applications have features that allow a user to share curated content with others, either by posting it directly on Facebook, Twitter or another social media account, or by building up a list of followers directly on the curation site. Here are five popular, free content curation platforms. Most includes a paid level and some offer full-blown enterprise systems. With the premium solutions, users get a broader array of options, but before investing financially, start with the free version and get more familiar with the platform’s features. Scoop.it is a robust platform that allows users to create different topic boards. The system will search the web for content on the topic and return results for the user to choose from. It accommodates adding various content pieces to boards, along with comments from the user about why the curated article matters. The user can opt to follow other Scoop.it users, other topics and other scoops. The system tabulates the number of people who follow and who read the individual pieces of content scooped. They have a free version that provides limited results and premium levels for the more serious user. Paper.li searches the web for content related to a specific topic that is determined by the user. This platform pulls a range of content items and arranges them in sections much like an old-fashioned newspaper once did. Sections include Headlines, Business, Politics, Science, Environment and more, which vary depending on how the user wants their paper to appear. They have a free and paid version; the free version of Paper.li doesn’t allow users much control over which pieces of content are included in the layout and which ones are excluded. If the business only wants to see or feature content from specific sites, they would need to invest in a pro account. Users can subscribe to a business’ Paper.li to be delivered via email. Social sharing automation is also a feature of this platform. Here’s an example of Advice Local’s Paper.li that is created daily. We have the pro account, so we can feature specific sites’ content, such as the piece from Rocks Digital, or specifically not include sites, like a competitor. We can also include ad images, which we have done when featuring products. List.ly allows users to create intriguing lists. Like most other content curation platforms, List.ly lets users follow other list builders, attract followers of their own, embed their lists in their website and evaluate their lists based on a built-in analytics program. People love lists — reading them, creating them and adding to them. List.ly allows for all of this. Users can gather content, add their content to other users’ list and much more. Besides using List.ly to follow others’ lists for curation ideas, users can create their own lists featuring their content which will help drive site traffic and improve SEO. Since List.ly lists can be embedded into a user’s website or sent via email, using a tool like this also helps make sharing curated content easy. Pinterest is so popular that many people think of it as social media rather than a content curation platform, but it’s actually both. 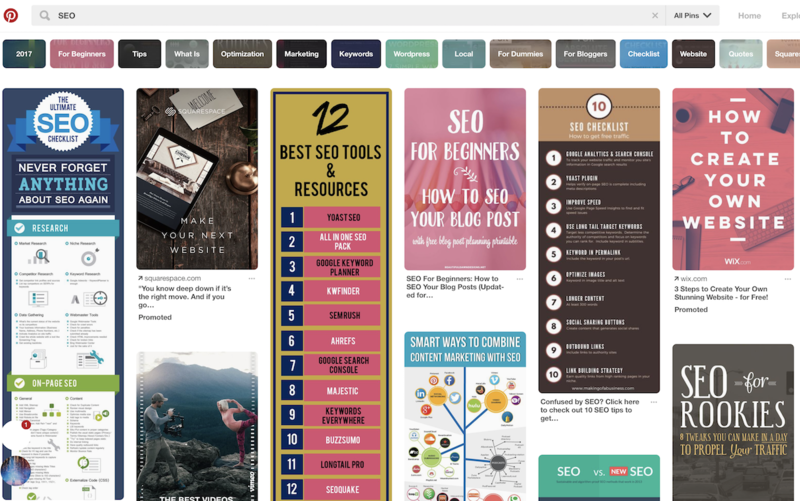 A user can create an unlimited number of topic boards, either solo or with users. They can upload their own photos and graphics, re-pin images from other Pinterest users and pin other content they come across on the web. Searching on Pinterest and following other users’ boards is easy. Pinterest also has basic analytics included if the user is looking to leverage it as a marketing platform. Pinterest appeals to a wide range of audience segments, so the potential to find all different types of content for curation is massive. Here is a search example for the phrase “SEO.” I’m only showing a glimpse of the result that was returned below. Notice the additional suggested search phrases that also populated, which would drill in more specifically on the topic. It’s important to understand, content curation platforms have many benefits beyond just the useful photos, articles, videos and other content that it identifies for distributing. Depending on the methods used when curating content, in addition to supplementing a business’ content marketing efforts, it also provides new pages and posts for search engines to index on the business’ website, grows a subscriber list and keeps a target audience engaged. Now that we have covered all the ways to find content to curate, next time we’ll cover the different types of content curation methods. 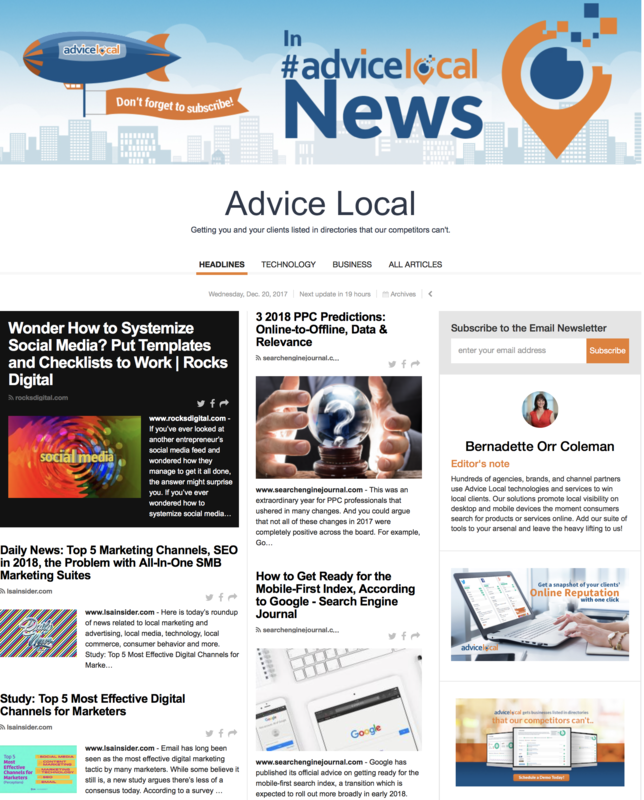 Beyond creating and sharing local-focused content, understanding where a business places in local search results, what others are finding about the business when they search, and how they stack up to the competition is imperative. Run a free online visibility report today and find out.